Simon & Schuster, 9781501124495, 368pp. Celebrating the 100th anniversary of Sinatra’s birth, a startling, compelling, yet affectionate portrait of an American entertainment legend by his youngest daughter, who writes about the man, his life, the accusations, and about the many people who surrounded him—wives, friends, lovers, users, and sycophants—from his Hoboken childhood through the notorious “Rat Pack,” and beyond. Frank Sinatra seemed to have it all: genius, wealth, the love of beautiful women, glamorous friends from Las Vegas to the White House. But in this startling and remarkably outspoken memoir, his youngest daughter reveals an acutely restless, lonely and conflicted man. Through his marriages and front-page romances and the melancholy gaps between, Frank Sinatra searched for a contentment that eluded him. Tina writes candidly about the wedge his manipulative fourth wife, Barbara Marx, drove between father and daughter. My Father’s Daughter, with its unflinching account of Sinatra’s flaws and foibles, will shock many of his fans. At the same time, it is a deeply affectionate portrait written with love and warmth, a celebration of a daughter’s fond esteem for her father and a respect for his great legacy. Even now, as we celebrate the 100th anniversary of his birth, the world remembers Frank Sinatra as one of the giants of the show business. 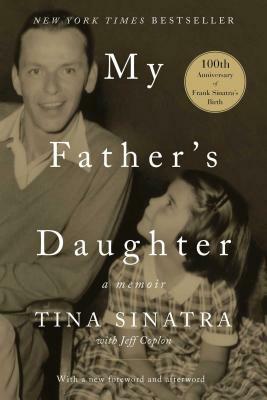 In this book from someone inside the legend, Tina Sinatra remembers him as something more: a father, and a man. Tina Sinatra is the youngest child of the American singer and actor Frank Sinatra and his first wife, Nancy Barbato Sinatra. My Father’s Daughter is her first book.